Today was our "moving- on" day--we're on our way to Brussels for the last 4 nights of this trip. We checked out of our apartment at 11:00, and the very kind apartment owner gave us a ride to the train station. How nice is that? We bought our tickets, and hustled to make the 11:23 train to Brussels. It was a short 1/2 hour ride into Brussels Central station. We followed the signs for the exit where how hotel is--they weren't kidding when they said very near the train station--it's literally attached to the lower level shopping area of the station! By noon we were checking in to our hotel-The Novotel Off Grand Place. Our room wasn't ready yet, but they stored our luggage and we set off to explore a little and find some lunch. There's a small square in front of our hotel and there was a craft market set up today--we did a quick cruise through, and then continued on down the street. There were LOTS of people out today--oh my! 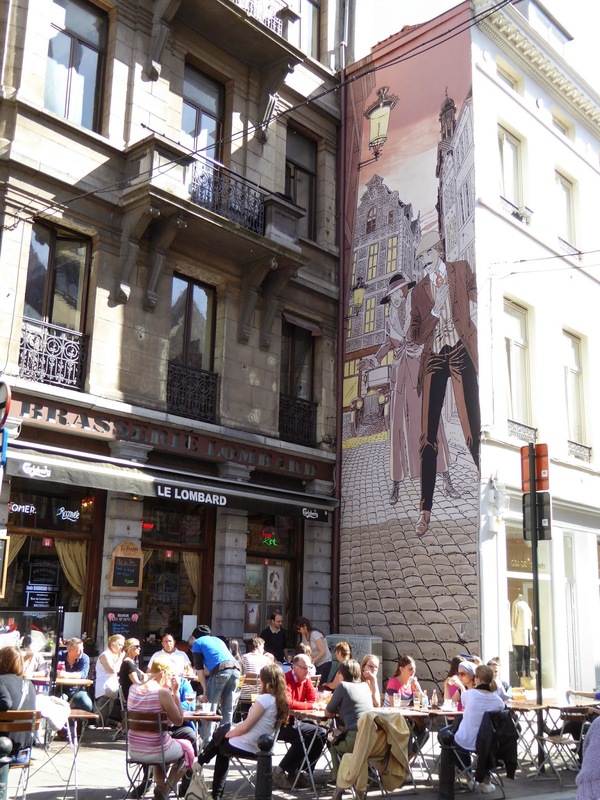 We chose a sidewalk cafe just a couple blocks away, we didn't feel like wandering in the crazy crowds, and we were hungry as we'd not had any breakfast in Gent. David ordered a steak--rare. And RARE it was, I think it might have moo'd at him! He was a good sport and ate it all, and even said it was very good. I ordered BBQ ribs and they were meaty & delicious. Both meals were served with fries (they DON'T call then FRENCH fries here in Belgium!!). As usual, the fries were crisp and VERY good. We made our way back to our hotel to see if our room was ready--no such luck. We were given two free drinks at the lobby bar while we waited--nice service. Finally, our room was ready and we just dumped our bags and headed back out to explore. Our room is very nice, but a bit on the small size, especially for an "Executive Room" upgrade. The upgrade includes a free mini-bar, with bottled water, bad beer (Stella Artoise) and a Special K bar--whooopeee! 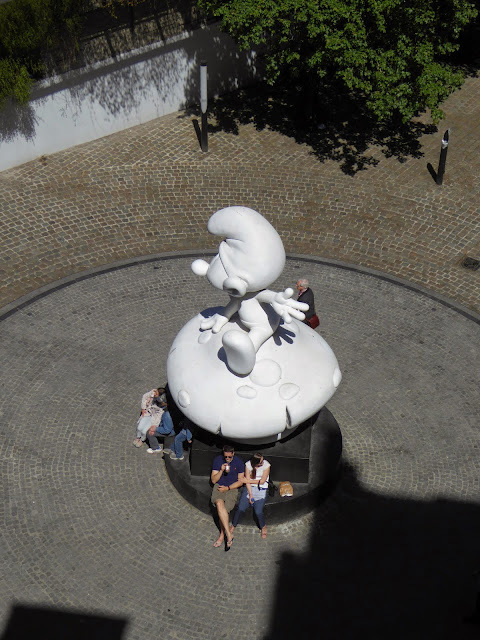 We are directly above the Smurf Statue, installed in 2012. Kind of cute……..
After we checked in to our room, we wandered in the direction of The Grand Place, the historic old market square in Brussels. 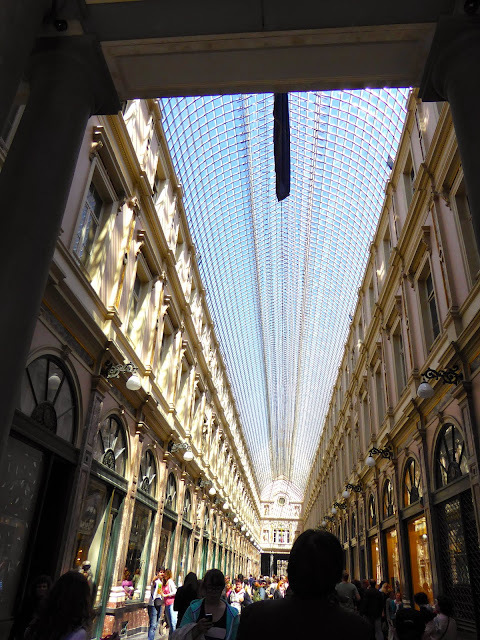 We passed this pretty covered passageway, I don't think it's original, but it looks like a good spot to do some window shopping. We thought we'd save it for latter--way too many people! 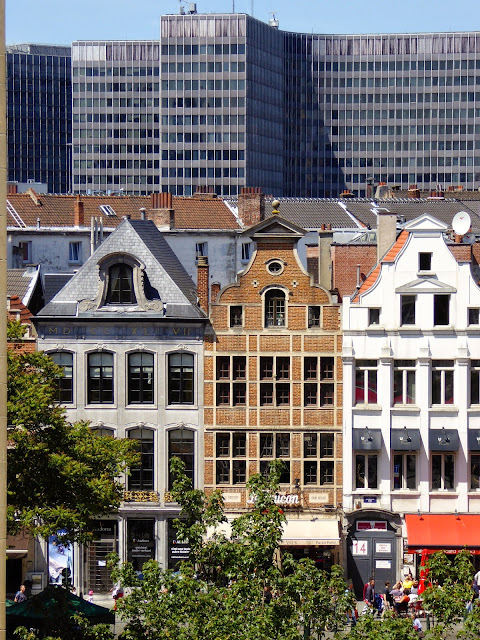 We came to the Grand Place--it's really very pretty, but I didn't take any pictures. There was a large stage set up for a jazz concert, and it was MOBBED with people--seriously wall to wall people and we just shuffled our way right on out of there! We'll try again tomorrow……. We continued our slow shuffle down a small side street trying, without much success, to get away from the crowds. We came to a big crowd taking lots of photos. 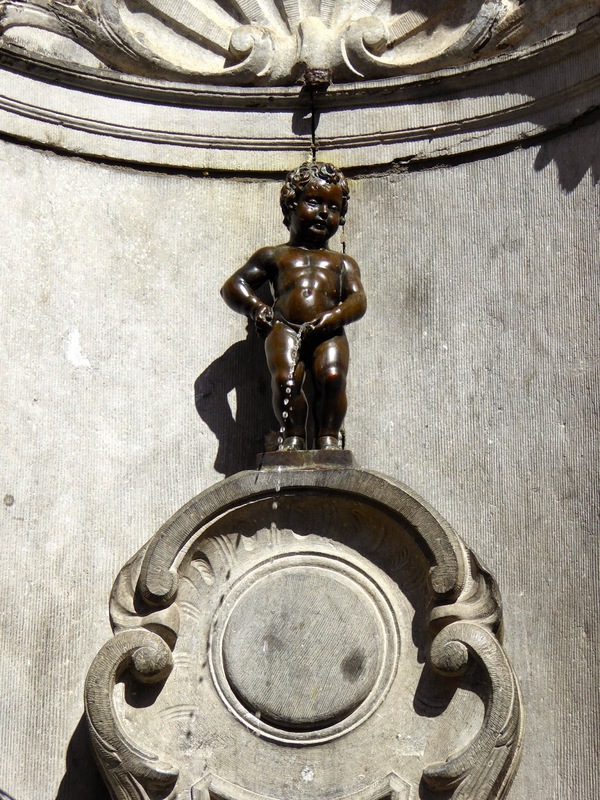 Ahhhh-we've found the "Mannequin Pis"! 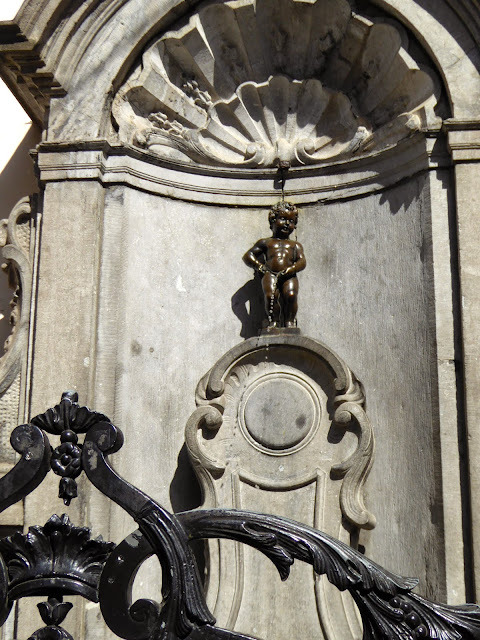 That famous little (2 foot tall) guy was installed on this street corner in 1619. It's been stolen several times, so I'm guessing this is not the original but a replica. I've read that the city of Brussels has been given hundreds of costumes from countries all over the world, and on special occasions the statue is dressed up. I was thankful we got to see him in his natural state. Although---I've seen photos of him in an Elvis outfit………..
We kept wandering and finally got out of the crush of people, somewhat. We thought it was time for a mid afternoon rest and cold beer, and finally found an empty table on the sidewalk. We snagged a table next to a nice couple that were just leaving. They struck up a conversation, and we ended up spending 2 hours visiting with them! 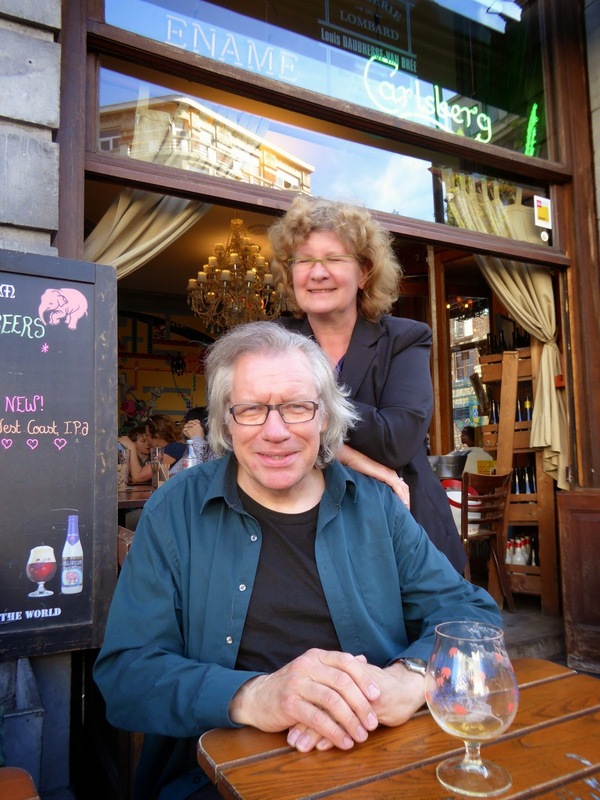 It was their 40th anniversary and they'd driven from their home in Antwerp to the big city to celebrate. We bought them a beer--then they bought us a beer….etc, lots of FUN! They were a lovely couple and we really had a great time visiting with them. He is a musician--and he even sang a few lines for us. We exchanged emails and FB info, Dirk even said he'd give us a personalized tour if we ever returned to Antwerp. We'd sure take them up on that offer--they were just wonderful fun! Have I ever mentioned that we meet the nicest people when we travel?? We are so lucky! After our lovely 2 hour visit with Dirk and Ria it was just about dinner time. We'd spotted an Ethiopian restaurant a couple of blocks away, and that intrigued us. Unfortunately they were full--but we'll try again before we leave Brussels. We settled on a nearby Cuban Cantina. We each ordered the "national dish of Cuba" (according to their menu) Ropa Vieja, which is Spanish for "old clothes". It's a shredded pork dish, and it was pretty good. It was served with delicious fried bananas, rice with black beans and African potatoes. We ordered a side dish of corn puree--really good stuff. Add a carafe of red wine, and it was a fine dinner. We made our way through the crowds back to our hotel. The Grand Place was still crazy crowded, but we definitely will be going back to see some of the interesting buildings. Tomorrow--when there's not so many people! Good night from Brussels--please keep your fingers crossed for lighter crowds tomorrow!